Many Government Health Services are accessed via your GP or other health professionals. This list is to give you an idea what is available and you can contact the service directly for general information. To access information on-line, go to the home page of www.gov.im and click on the Health and Wellbeing box.? Here you will find a menu on the left hand side detailing the services provided and click on the one that you wish to know more about. Should you find the whole process of seeking information bewildering you can request help from the Social Work team on a one meeting basis for guidance at tel: 686179 (new referrals). This busy department will do their best to respond as quickly as possible but it may take some time. If you already have a social worker then contact them direct. See more information at Social Care below. To telephone look under I in the phone book for Isle of Man and go to Health and Social Care, Department of . There is a list of departmental numbers here relating to health services. Mental Health Service. Phone 642843 for general enquiries. The Crisis Resolution Home Treatment Team is sited at Grianagh Court, Strang and can be contacted on 642860. Other services are listed in the phone book under I for Isle of Man Government, Department of Health. Speak to the GP if you have concerns about an older persons mental health, be it your own or someone you care for. They can refer you to the Older Persons Mental Health Service (OPMHS), a multidisciplinary team who specialise in age-related conditions. The Older Persons Mental Health Service provides assessment, diagnosis, treatment and support to clients with “functional” disorders such as depression and anxiety, schizophrenia and bi-polar disorder, as well as mild cognitive impaiment and dementia. They have a multidisciplinary team who liaise with acute inpatient wards, nursing and residential homes and the elderly mentally infirm units on the Island. However, a major part of their role is to promote independence at home and a large part of their work is to offer comprehensive assessments for people with memory problems. If you would like a copy of your appointment sent to your carer (so you don’t forget it) you can request this when the nurse visits you. For physical disability, contact details for the services below are listed in the Manx Telecom phone book under I for Isle of Man Government, Department of Health and Social Care. Physiotherapy units – Community Health Centre, Douglas, Thie Rosen for the south of the island, and at Ramsey and District Cottage Hospital for the north. Please note that this service is run on a self-referral basis unless you are under 16 or have certain conditions. (Contact your GP in these cases). For more information and a form online check out https://www.gov.im/categories/health-and-wellbeing/therapy-services/physiotherapy/ . Ask in your GP’s surgery or local hospital for a paper form. Reablement Service – https://www.gov.im/categories/caring-and-support/adult-social-care/adult-services-for-older-people/reablement/ is a rehabilitation service designed to improve health and enable older people to remain living at home. Speech and Language Therapy Service. Occupational Therapy – helps to maximise independence with aids and little tricks. Stroke Unit – for those who have suffered a stroke. Centre for Independent Living – looks at which would be the best aids for an individual and provides contacts for suppliers. District Nurse Service – provides nursing care in the individuals home. Orthotics and prosthetics eg false limbs, false eyes, heel raisers, shoe adaptions etc. Ambulance Service – for those who need to use the ambulance service when they have no-one to take them to hospital appointments.? Please note that the charity Care in Mann operate a volunteer-run taxi service funded by donations. Continence Advisor – works out the best solution for continence problems and arranges delivery of items direct to the house. Podiatry – for foot care. Family Practitioner Services – Dental and Opthalmic Enquiries, and GP registration enquiries. Salaried Primary Care Dental Service Clinics (previously known as NHS Dental Service). Audiology (Hearing Clinic) – provides hearing tests and hearing aids when required. Live Well Stay Well Scheme. Patient Transfers (Off-Island) – travel arrangements for IOM NHS patients needing to go off-island. Telephone Numbers of Social Care Provision can be found in the Manx Telecom directory under I for Isle of Man, Department of Health and Social Care. Adult Services and Children and Families Services – this includes the Social Work teams. They can be invaluable in guiding you through what is available to help you maximise your quality of life. All referrals for Adult Social Care have to go through the Adult Services Access Team. If in hospital please ask for a referral to be made. Department will provide signposting to meal delivery services. The Treasury Department includes Social Security. Benefits and other services of interest here include; Attendance Allowance, Disability Living Allowance, Carers Allowance, Blue Badge Scheme, glasses under the Voucher Scheme, Industrial Injuries Disablement Benefit, War Disablement Pension, All Work Test. Step by step you can also get here by accessing the Isle of Man Government website at www.gov.im then click on the home page box for Benefits and Financial Support, click on the Social Security Benefits A-Z and search for the support required. You can access a claim form at the bottom of the benefit page you think you qualify for. Check through the qualifying details carefully to save wasting your time (and theirs) before applying. Arrangements are made by schools on a day-to-day basis to meet the needs of the vast majority of learners with a disability (Special Educational Need, SEN), without the need to call upon specialist assessments, interventions, or provision arrangements. This means that schools routinely monitor the progress of all pupils, and take steps to identify and assess special educational needs, calling upon specialist support from the Department as appropriate.? Each school has a designated Special Needs Coordinator (SENCO) who parents can contact directly through the school. While SfC maintains these services, school SENCOs coordinate support arrangements between the child/family, the school’s teaching staff, Services for Children and any other agencies that might be involved. The Department of Education and Children works closely with partner agencies (eg, speech and language, the Child and Adolescent Mental Health Service and Occupational Therapy) to ensure children and young people have access to appropriate services and resources. Headteachers and SENCOs of each of the Islands schools will be more than happy to discuss individual needs with you, including accessibility, provisions and specialist resources. School contact details can be found here: https://www.gov.im/categories/education-training-and-careers/schools-and-colleges/. Services for Children can be contacted on 686084 or 686059. For those disabled children who are interested in engaging in sports, check out the excellent Disability Sports Directory compiled by the Sports Officer for the Disabled, Zoe Crowe, to see what is available. Disability Sport Directories can be found on the Sports Development website: https://msr.gov.im/sports-activities/disability-sports/ or at the National Sports Centre. Zoe can be contacted on tel: 01624688575 or email Zoe.Crowe@gov.im. Disabled Go and BrowseAloud options are available on the DEC Website. 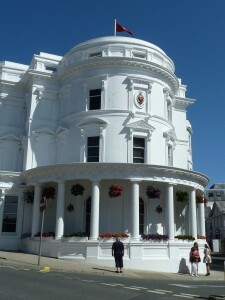 The Villa Marina and Gaiety Theatre have audio loops installed for the hearing impaired. The Gaiety Theatre has a rolling subtitle facility installed for those with hearing impairment, visible from certain points. This service is available on certain dates. Enquire by tel: 600555. The Villa Marina has fully accessible facilities. The Gaiety Theatre can access the disabled toilets in the arcade next door. Only the stalls are accessible in this beautiful old building to wheelchairs, via the arcade entrance. Ring the number above for more information. The Isle of Man Constabulary have a policy of social inclusion that includes disability. Their aim is to improve their interactions with people who are disabled. Contact Catherine Bradley on 631212 for more information. This department looks after roads, the airport and ports. See the access section for more information. They are also responsible for Sheltered Housing.